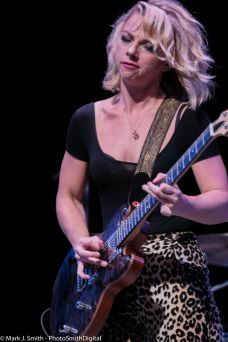 The mood was a key ingredient for the music on Belle of the West, the latest release from Samantha Fish. For the recording, Samantha headed to the Mississippi Hill Country, recording at Zebra Ranch with Luther Dickinson once again producing, following production of her 2015 release, Wild Heart. Joining in on Belle of the West were Lillie Mae (vocals on “Nearing Home”), Lightnin’ Malcolm (“Poor Black Mattie”), Jimbo Mathus (upright bass), Amy Lavere, Tikyra Jackson, Trina Raimey and Shardé Thomas. The gathering of musicians fit the vision that Samantha had for the album, and her desire to ‘do this acoustic-electric record, and tap into the style and swagger of Mississippi. Any time you dive into another place, another vibe and a new group of people, you’re challenging yourself to grow musically. I felt very at home a Zebra Ranch, and I’ve known Luther and Malcolm for years, so it was a very comfortable situation. When you’re making a record like this, it has to feel natural if you want people to respond to it’. Belle of the West samples a south of the border melody and story line for the Jimbo Mathus penned title track while the album dances from Country-tinged cuts (”Need You More”) into the Blues (”Don’t Say You Love Me”). Samantha Fish keeps moving the borders of the Blues with Belle of the West, feeling that ‘I’m never gonna be a traditional blues artist, because that’s not who I am. But it’s all the blues for me. When Muddy Waters and Howlin’ Wolf came out, what they were doing didn’t sound like anything that had been done in blues before. You’ve gotta keep that kind of fire and spirit. I’m never gonna do Muddy Waters better than Muddy Waters, so I have to be who I am and find my best voice’. Belle of the West features a fiddle line and soft harmonies drifting over the rugged rhythms of “Blood in the Water” as Delta rhythms and riffs slide across “Gone for Good” and a snaking guitar hook chases “No Angels” while Samantha Fish warns of “Daughters” and follows a fife into album opener “American Dream”.